One of the quirkiest venues in our list, Croker’s Folly in St John’s Wood is a Lebanese restaurant housed in a pub with exquisite interiors. 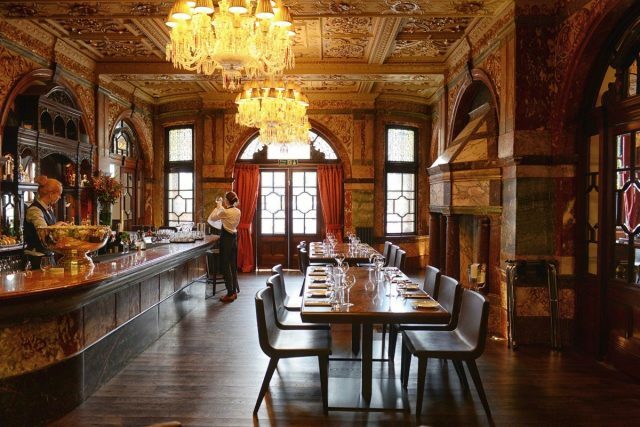 Dating back to 1898, the space was created by entrepreneur Frank Crocker, who built a hotel in the late 1890s in anticipation of an influx of guests that would visit the north London borough once the new terminus of the Great Central Railway opened. Sparing no expense, he lavished the space with carved mahogany panelling, cherub statues, soaring pillars, crystal chandeliers and no less than 50 different kinds of marble. Sadly for Crocker, the railway route changed and his beloved hotel was never the roaring success he hoped. Luckily for diners with a taste for opulence, very little has changed since 1898 and guests can gawp at its Victorian elegance while enjoying Lebanese classics like hummus with pine nuts and chicken shawarmas.